Kroger shoppers, here is your source for the upcoming Kroger Ad preview for next week, as well as the current Kroger Weekly Ad Scans for this week. For those of you looking to score the best deals the Kroger Flyer Preview will help plan your upcoming Kroger shopping trips! If you who take shopping seriously use the Kroger flyer and make sure you have all the Kroger Coupons, as well as manufacturer coupons, for the upcoming Kroger sales ad and pay special attention for any Kroger Mega Sales deals! Be sure to use the coupon database to look for the available coupons while you’re browsing the Kroger Weekly Ads! You will find a listing of the upcoming Kroger Ad Preview scans below. Just scroll down the page and click on the Kroger Sales Flyer you are interested in reading. Then your can scroll through each page of the Kroger Ad and find the best deals coming up at Kroger! 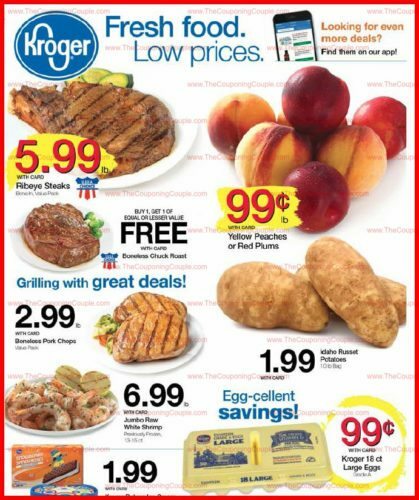 In addition to the Kroger Ad for next week, make sure you check out all of the other stores on the main Weekly Ad Scan Page for all of the other store ad previews we have posted! In addition to the most current latest Weekly Ad Preview above, you can check out all of the other weekly ad previews for all of the other stores HERE! You can also check out the Kroger Coupon Matchups and all our other posts related to Couponing at Kroger! Krogers “10 for $10” sale is just like it sounds (but even better). Just find all of the included items in the Kroger Weekly ad and buy any amount for just $1! You don’t have to buy 10 items but you do need to use your Kroger Card to get the discounted price! Definitely the most popular Kroger Sales format and usually runs 2 weeks. These MEGA Sales come in different quantities and discounts but the most popular with Kroger shoppers is the BUY 5, SAVE $5 MEGA Sale! With this type of sale you can mix and match items included in the sale in order to buy the correct number of items to get the discount! In the case of the BUY $5, SAVE $5 you would get $5 off for every 5 qualifying items purchased! Another popular MEGA Sale format is the Buy 6, SAVE $3 Savings Event! Make sure and load your Kroger FREE Friday Download to your card each week! You can find the Kroger Friday Freebie by visiting the Kroger Digital Coupons page each week! If you want to know ahead of time what the FREE Friday Kroger item will be then scroll through the latest Kroger Flyer or check out our weekly Kroger Free Friday Download post! Do you shop at other stores? We also post the early previews for other stores for many more stores each week. You can browse the EARLY Publix Ad, Aldi Ad, Winn Dixie Ad, CVS Ad, Walgreens Ad, Rite Aid Ad, Target Ad and more! Just head over to our Weekly Ad Preview page to see all of the early ad scans we have available. Select the Kroger Ad Preview you want to Browse Below!